Are Windows 8 sales good or bad? 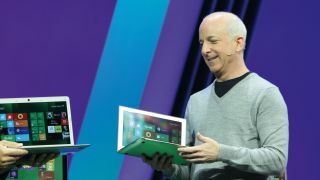 Asus's chief financial officer, David Chang, told reporters that "demand for Windows 8 is not that good right now." That's not what Steve Ballmer says: according to him, Windows 8 is doing enormous numbers. By enormous, we really do mean enormous: Windows 8 has sold 40 million licences in just one month, and upgrade sales are higher than they were for Windows 7. Not only that, but Steve Ballmer says that Windows Phone sales are four times higher than they were last year, that there are more than 1,500 different Windows 8 PCs, and that the Windows Phone Store has more than 120,000 apps. And that's numberwang! Hold your horses, says our columnist Gary Marshall: what do these numbers actually mean? Windows Phone sales may be four times larger, but four times larger than what? "If you ask Steve Ballmer for actual figures, he gets all shifty," Marshall says, suggesting that if you ask how many phones Microsoft sold last year, "Ballmer would pretend to recall, only to shout 'Over there! Rihanna! Naked!'" before throwing himself through a plate glass window. 40 million Windows licenses? "Were they sold to actual customers, or to OEMs?... We'd ask Ballmer, but he's pointing at something behind us and making an OMG face." Microsoft isn't the only offender either: Amazon's even more vague. "The firm tripled its sales day record on Black Friday, selling an incredible hemhemhem compared to last year's fiddlededee," Marshall explains. "The discounted Kindle Fire sold feefifofum, a huge improvement over last year's doobiedoobiedoo, and overall sales of the Kindle family exceeded one bibbetyboo." Such claims are "PR puffery, a story without any substance." One story that appears to have quite a bit of substance is Windows Blue, the next generation of Windows. As Scott Nichols explains, "the software giant is taking a new direction with Blue, focusing on more frequent annual updates for a more standardised OS." From mid-2013, Windows would be on an annual update cycle, in much the same way OS X and iOS are. Rather than one enormous new Windows every three or four years, Windows Blue would deliver a new mini-Windows every year. Mini-Windows isn't the only small thing we're interested in: we've just discovered that Nintendo's been working on a small Wii, which sadly it won't be calling the Wee Wii. The Wii Mini, as it's called, will go on sale in Canada in time for Christmas, and presumably it's going to turn up elsewhere too. TechRadar reviews editor James Rivington gets his calculator out: "That's 99 Canadian dollars," he says, "which works out about the same in US dollars and about £62 in the UK... specs are broadly the same as the current Wii, though there's no Gamecube emulation available and the system has no internet connectivity either, which means no internet gaming and no services like BBC iPlayer." We've got another mini, too: Samsung's Galaxy S3 mini, which we've reviewed in typically exhaustive style. "Is smaller always more beautiful?" Thomas Thorn asks, before answering with a pretty firm "no": it looks great, but it's quite expensive for what you get. Did you know that Christmas is coming? Well, it is - and Microsoft is getting into the Christmas spirit by giving Google a good shoeing. Bing's new "don't get Scroogled" campaign claims that Google's shopping service is ruining Christmas, because in the US "Google Shopping now decides what to show you – and how prominently to display what product offers they show - based partially on how much the merchant selling the product has paid them." Microsoft, you'll be amazed to discover, thinks you should use Bing instead - and it doesn't mean Bing Crosby.